While it is true that most congregations no longer employ full-time cantors, there is nevertheless no shortage of cantors in Pittsburgh. In fact, there currently are six invested cantors here who are members of the Conservative movement’s Cantors Assembly. The six local CA members are: Congregation Beth Shalom’s Rabbi Seth Adelson; Cantor Moshe Taube, retired cantor of Beth Shalom; Rabbi Hazzan Jeffrey Myers, spiritual leader of Tree of Life*Or L’Simcha; Cantor Henry Shapiro, spiritual leader of Parkway Jewish Center; Cantor Rob Menes, executive director of Beth Shalom; and Cantor Laura Berman of Temple Sinai. Stephen Stein, executive vice president of the CA, and a former Pittsburgher, took notice. “He called a meeting in Pittsburgh late last spring and suggested we have a series of concerts to celebrate the power of music and the cantorate,” said Berman. The local CA members were on board. The April 7 show is a tribute to composer and conductor Leonard Bernstein in commemoration of his 100th birthday, and will be held at Temple Sinai. 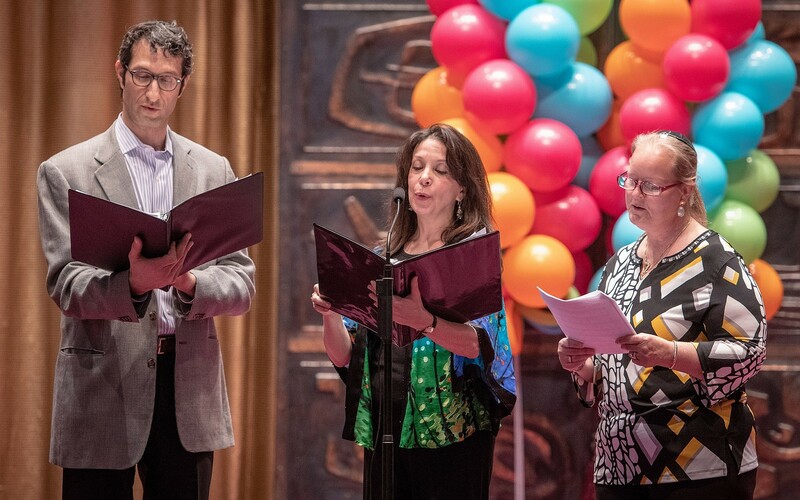 Three choirs will join together in song: Temple Sinai’s Intergenerational Choir; Rodef Shalom’s choir, Rodef Shira; and members of Pittsburgh’s Bach Choir. They will be conducted by the artistic director and conductor of the Bach Choir, Thomas Douglas. Local members of the CA, as well as several visiting CA members and some “talented members of the community,” including 10-year-old Ben Nicholson, will perform Bernstein works through solos and ensembles. Violinist Lorien Benet Hart and cellist Michael Lipman — both members of the Pittsburgh Symphony Orchestra as well as Temple Sinai — will provide accompaniment. Flavio Chamis, a Pittsburgh-based conductor and member of Temple Sinai, who worked with Bernstein throughout the world from 1985 until his death in 1990, will share stories and photos of the legendary composer. Chamis said that Bernstein taught him not only about music, but about life. The Temple Sinai concert will include songs from “West Side Story,” “Candide,” “On the Town” and “Peter Pan,” as well as music that may be less familiar to some audiences. “There will be music recognizable and that people are looking forward to, as well as music expanding people’s awareness of the scope of Bernstein’s music and Jewish influence,” Berman said. The Temple Sinai show is just one of many worldwide events celebrating 100 years since Bernstein’s birth. Berman is “thrilled,” she said, to be organizing the show that not only celebrates Bernstein, but demonstrates the collegiality of the cantorate here.